1. Scrub the sweet potatoes and trim off any knobbly bits you don’t want to eat. (You can peel the potatoes if you prefer to do this but I don’t mind the skins). 2. Slice the potatoes lengthways or alternatively in to thick “coins” (about 1 inch thick is a nice size), depending on the size of the potato and your personal preference. 3. Place the potatoes in a steamer (I do mine on the stovetop) and cook until nice and soft; this typically takes about 15 minutes for me. Remove and allow to cool a little. Store any potatoes you’re not using right away in an airtight container in the fridge; they will last 4-5 days. 4. 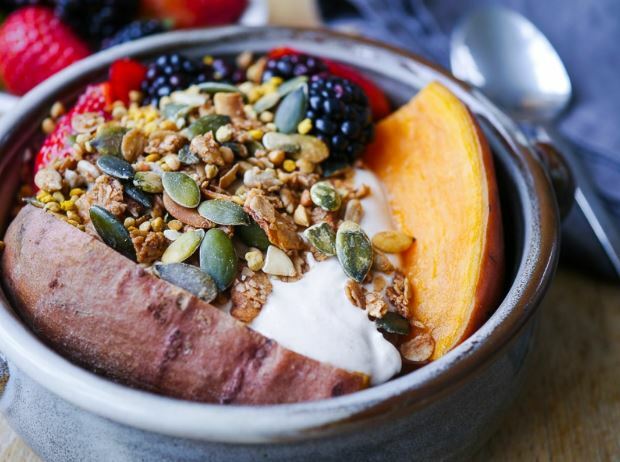 To serve, take about 200-250 grams sweet potato, top with 1/3 cup yoghurt, half a cup of berries, and a handful of mixed seeds or granola. Sprinkle over a pinch of cinnamon. Enjoy!